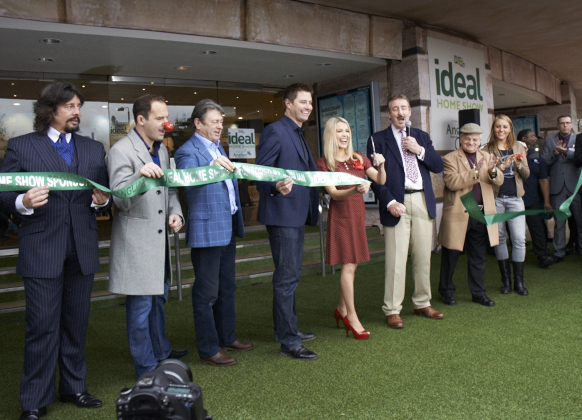 It’s been an action-packed opening day at the Ideal Home Show, sponsored by Anglian Home Improvements, with so many exciting things to do and see, it’s hard to know where to start. We arrived bright and early to make sure everything was ready in time for the official opening at 10.00am. A marching band entertained the crowds that had gathered outside Earls Court before the lovely Melinda Messenger cut the ribbon to officially open the show, accompanied by a celebrity line-up that included TV presenter and architect George Clarke, gardening guru Alan Titchmarsh, interiors icon Laurence Llewelyn-Bowen and money saving expert Martin Lewis. Being Comic Relief Day, there were a few red noses on display – including on the horses of our six Anglian Knights, hidden in and around Earls Court. Visitors who follow the clues to find the six horses and collect the required information along the way are in with a great chance of winning a whopping £5,000 of Anglian windows and doors, plus we’re donating £1,000 to the Ideal Home Show’s Comic Relief fund. 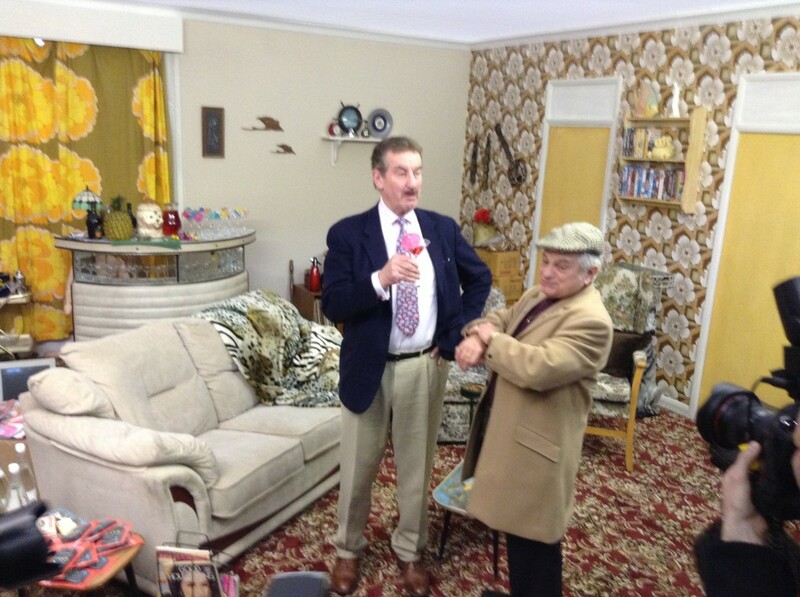 In the centre of the show, people have been queuing up to visit Del Boy and Rodney’s flat from the Only Fools and Horses series, complete with 1960’s carpet, curtains and wallpaper. Even Boycie from the original show was there to see the Trotters’ tower block flat get a modern day makeover by our friends at House Beautiful, while George Clarke shared tips on how to use small spaces efficiently. You know it makes sense! It’s been lovely to see so many of our Anglian customers today, all benefitting from the Anglian VIP experience including fast-track entry into the show, priority seating in the Ideal Super Theatre, Seasonal Cookery Theatre and catering area, plus lots of free goodies from the Anglian stand. Meanwhile, our very own marketing director, Martin Troughton, was part of the judging panel along with TV’s Alan Titchmarsh for the Ideal Young Gardeners of the Year competition, in association with the Prince’s Foundation for Building Community. David Domoney, who we’ve worked with at the Hampton Court Palace Flower Show over the past couple of years, hosted the presentation ceremony this afternoon in the popular Ideal Super Theatre. The six participating horticultural colleges were presented with their awards, with the Best At Show title going to 2012 winners, Chichester College. Ideal Home Show visitors will continue to vote for the People’s Choice winner throughout the show, with the winner being announced once the 2013 event has closed. 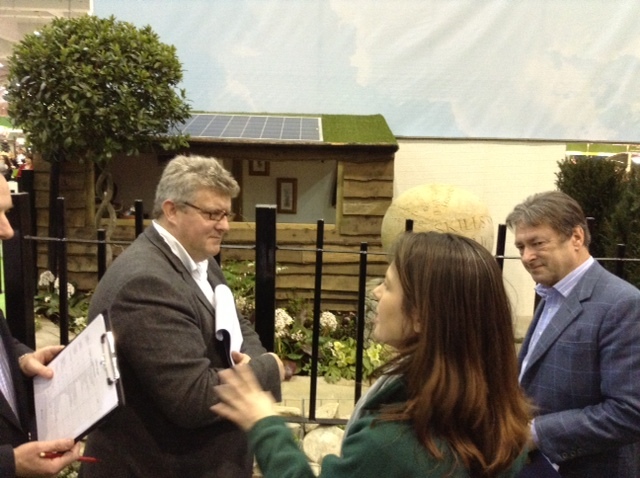 The Ideal Home Show is open until 1st April so there’s plenty of time left to enjoy the show if you weren’t here today. We’re on stand 1V12, just behind the Ideal Super Theatre, so do come and say hello or post a comment to let us know your favourite part of the show.